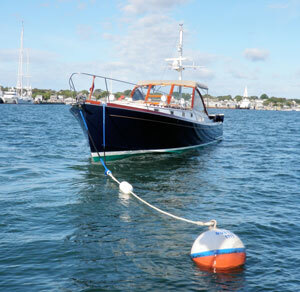 This powerboat is moored through both bow chocks with two of New England Ropes' Cyclone Mooring Pendants. The bottom white section of the pendant is traditional three-strand nylon. A permanent mooring must remain secure for long periods while unattended, occasionally under adverse conditions. For peace of mind, it should be properly sized for the job, and determining the minimum size has a lot to do with the conditions under which the boat is moored, the amount of fetch for waves to build up, and whether your mooring is a temporary one, designed for overnight use in fair weather, or a mooring capable of riding out a hurricane. Below are the basic components. Concrete Blocks: Many boats use 50-gallon drums filled with cement, concrete blocks, auto engine blocks and other types of dead weight. This type provides the least holding power, working on the principle of sheer weight, but is reliable if pulled out of the bottom. If they drag, they will resist motion with a constant amount of force. Note that in seawater, concrete loses about 42% of its weight when fully submerged, so a mooring anchor designed to weigh 500 pounds on the seabed will actually require about 872 pounds of dry weight concrete. Mushroom Anchor: the most common type of mooring anchor is the mushroom, which, under ideal conditions, with the right kind of bottom, can dig in, create suction and develop good holding power. Mushroom anchors work best in a silt or mud bottom, and are not as effective in rocks or coarse sand. If a mushroom gets pulled out of the bottom, it is less likely to reset itself completely, and will merely skip along across the bottom. A weight of 5–10 times boat length is a good rule of thumb, as a bare minimum. The heavier the better, as long as you don’t have to move it. Pyramid Anchor: The cast-iron Dor-Mor pyramid anchor is a superior alternative to the mushroom. Its smaller size, concentrated weight and pyramid shape allows it to embed itself more rapidly, and its holding power (at a scope of 3:1) is up to about ten times its weight. 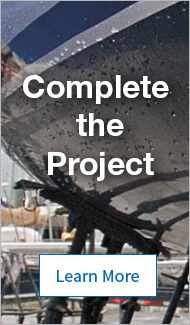 Recommended by Practical Sailor/Powerboat Reports in 2009. Helical Screw: while the above types rely for holding power on sheer weight or a combination of weight and embedding themselves in the bottom, the helical anchor is screwed into the seabed, usually by a barge-mounted hydraulic device. Helical screws have long, high-tensile steel shafts (8' length is common) with large screw threads (10" to 14" diameter) on the bottom and an attachment eye at the top. These professionally-installed anchors, originating in the offshore oil industry, have gained popularity with recreational boaters since the 1990s, and have the most extreme holding power in relation to their weight. Chapman’s recommends two sections of galvanized chain: a heavier, primary chain and a lighter, secondary chain. The primary (ground) chain lies on the bottom. Its length should be 1 1/2 times maximum water depth. 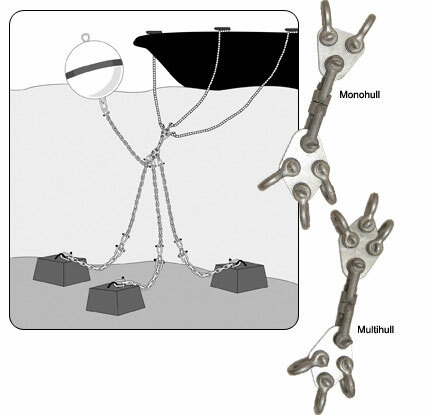 The secondary (riding) chain, is connected to the ground chain with a galvanized shackle or swivel. It's usually half the diameter of the ground chain and equal in length to maximum water depth. The heavier chain is not used for the entire run so that the mooring buoy does not have to support an excessive amount of weight. The chain should be as large as practical; make the riding chain at least double the size of the chain on your anchor rode. Two styles of Taylor mooring buoys are shown on typical systems with primary and secondary chain. 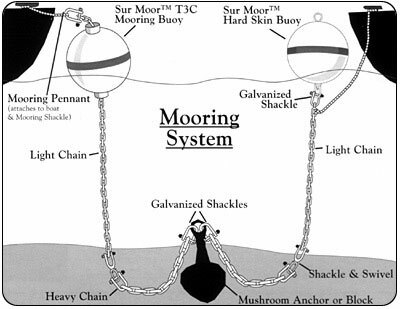 The sole purpose of the mooring buoy is to support the mooring chain. The two preferred designs for mooring buoys are a traditional buoy with hardware or a buoy with a tube through the center. Both offer reliable flotation and will last for several seasons, depending upon the salinity of the water. Obviously, freshwater applications will extend the useful life of any mooring system. The buoy must have about twice as much flotation as the suspended chain has weight in order for it to ride high enough in the water to be visible. The Taylor Sur-Moor™ T3C™ buoys allow you to pass the chain through the center of the buoy, and attach the pendant on top. Secure the mooring chain at the top using a 4" galvanized O-ring, such as Model 201105, and add the T3C™ Mooring Collar to protect the buoy from wear by the anchor chain and extend its lifespan. The pendant (pronounced “pennant”) attaches the chain to the boat. Large-diameter three-strand nylon line is used because its inherent elasticity (stretching about 10 percent under a load equaling 20 percent of its tensile strength) allows it to act as a shock absorber. Polyester line, Dyneema line or stainless steel wire is preferred by some for better chafe resistance. Length should be about 2 1/2 times the boat's freeboard. Diameter should be as large as is practical—but it must be able to fit through bow chocks and around a bow cleat. Effective chafe protection is recommended for the point where the pendant passes through a chock. This is critical, as failure caused by chafe at this location is one of the main reasons why boats end up on the beach. A light pick-up buoy at the boat end makes it easy to grab the pendant. Taylor’s Storm Surge Anchor System allows three anchors on a swivel. For real holding power, we would use real anchors instead of the concrete blocks in Taylor’s diagram! Cyclone Mooring Pendants, made from Endura-12 Dyneema line, were developed by Nantucket Moorings in conjunction with MIT. Traditional pendants are made from three-strand nylon, to absorb shocks by their elastic nature. This stretch, while allowing your boat a comfortable, cushioned ride, allows the line to move across the bow chocks, creating friction and causing chafe. Cyclone Pendants are attached (using a lunch pail hitch, also called a “cow hitch”) to your standard nylon pendant with its floating pickup buoy, and allow use of a low-stretch upper section. Their high tensile strength allows smaller lines to be used, so they fit more easily on boats with smaller cleats and chocks. Very low elongation results in a dramatic reduction in friction, heat and chafing. Also, because the top and bottom sections are just looped together through spliced eyes, you can replace a damaged section without replacing the entire pendant. Hurricanes making landfall in locations along the Eastern Seaboard have wrecked hundreds of boats over the past twenty years, many of which were driven ashore with their complete and intact mooring systems still attached. Weather forecasters predict that we are now in a period where we can expect more storms of greater destructive force, storms like Harvey, Irma and Maria that caused tremendous damage in 2017. Just how large does a mooring system need to be if your boat is caught in extreme weather? The following chart gives an estimate of the wind loads (based on the windage of the vessel) and the required size of a pyramid anchor. 20' 8/9' 1,600lb. 200lb. 3,600lb. 400lb. 25' 8/9' 2,200lb. 300lb. 5,000lb. 500lb. 30' 9/11' 3.200lb. 400lb. 7,000lb. 700lb. 40' 11/14' 5,400lb. 700lb. 12,000lb. 2,000lb. 50' 13/16' 7,300lb. 1,000lb. 16,000lb. 2,000lb. 60' 15/18' 9,100lb. 1,000lb. 20,000lb. 2,000lb. 80' 19/22' 13,000lb. 2,000lb. 31,000lb. 4,000lb. Based on wind loading data at min. 3:1 scope, with suitable bottom conditions for anchor to embed. Wind loads based on data from ABYC.